It’s only now that I’m finalising my thesis that I’m finding the work of U.S. curriculum studies researcher Arthur Applebee. His works include his first book Tradition and Reform in the Teaching of English: A History (1974) and the later Curriculum as Conversation (1996). 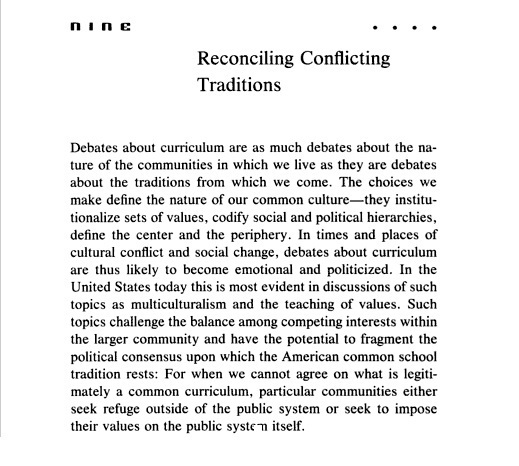 These are focussed on reviewing the teaching of English in the United States, but the historical connections he makes are invaluable to all of us in the field. A colleague at my university, Clare O’Farrell, has an established Ning that is home to members of the Poststructuralist Theory ‘Special Interest Group’ of AARE. Established it so well, in fact, that it is one of the few Nings I know of (along with the English Companion) that continued to have happy users after stupid-Ning made its stupid-serivce un-free. Hmph. Anyway, I use my space and profile on the ‘Ed Theory Ning’ to brain-vomit about (on?) theory that I don’t understand yet. And it’s proven #very illuminating. Increasing my activity in various groups on the Ning has also proven fruitful. Particularly in the ‘Daily Writing Club’ (we have to do exactly as it says…!) and now also from browsing the ‘Foucault reading group’. That’s where I was reminded to check out Clare’s actual blog, Refracted Input, which I hadn’t done for ages. This month she is discussing a quote by Foucault about ‘race and colonialism’, and in it I can see a relationship to contemporary discourses around changing technologies. 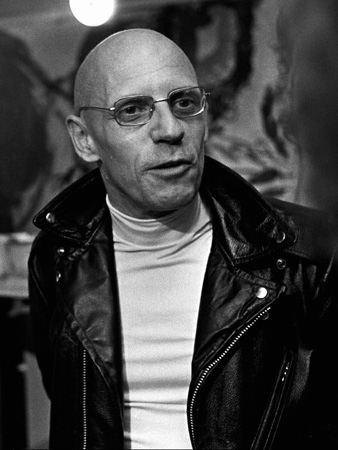 Michel Foucault, (1994)  ‘Veilleur de la nuit des hommes’ In Dits et Ecrits vol. I. Paris: Gallimard, p. 232. One cannot buy into the romanticism of the primitive – which is assumed to be so much closer to pure truth and ‘nature’. Conversely one cannot make the colonial assumption that one civilisation or one period of history (now) is more advanced and more evolved than another. That’s right. I don’t need to worry about whether I’ll ‘wreck’ anything, unless I’m thinking of the people I’m meddling with as OTHER. And I was using pronouns to construct myself in opposition to other through all those damn self-doubts. I don’t need to do that. FOUCAULT THAT! NB: Clare also curates a website on Michel Foucault, which includes a glossary of KEY CONCEPTS and other wonderful gems (thanks Clare!). Living in Brisbane but being from Sydney, I am a member of both the NSW English Teachers Association and the English Teachers’ Association of Queensland. 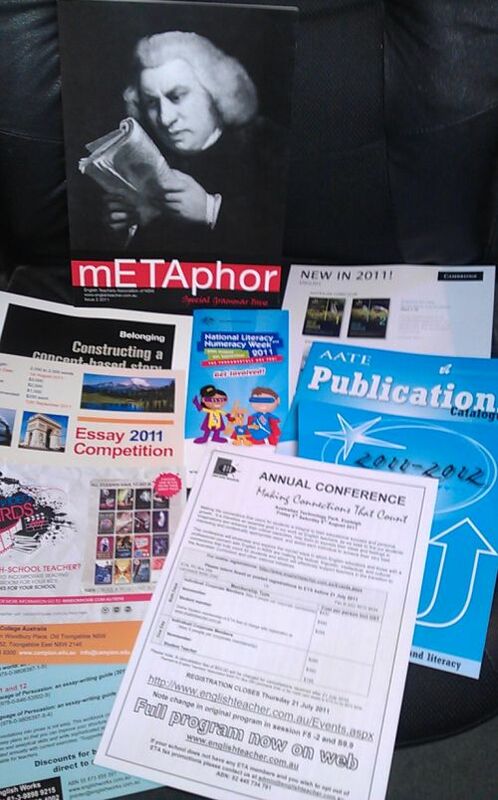 The holiday break and a fresh term starting has brought mailouts from both associations my way. This is a show-and-tell of what was in the respective packs. 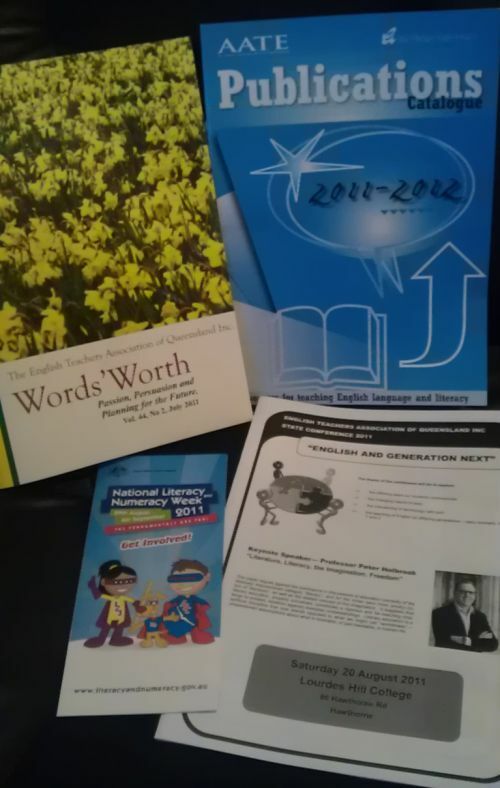 Both mailouts contained information about Literacy and Numeracy Week, which this year has as it’s theme ‘The Fundamentals are Fun!’ (hmmm, invoking fundamentalism to talk about literacy…looking forward to critiquing that), as well as a catalogue of publications available from the AATE Bookshop. The impetus for each mailouot is sending members the newest issue of the association journal. While I like the style of the NSW journal mETAphor better (the ETAQ journal is full of Arial font and the cover design could be developed, imho), I have to say I am really satisfied with the content and tone of Words’Worth, and look forward to contributing some material myself in future. Unlike in NSW, ETAQ doesn’t have resources to pay contributors for their articles (yet), but nevertheless the collegial spirit in the association currently ensures a flow of material to sustain the publication. My pre-end-of-tax-year book orders from the bookdepository.com have now all arrived and are awaiting my reading and attention! 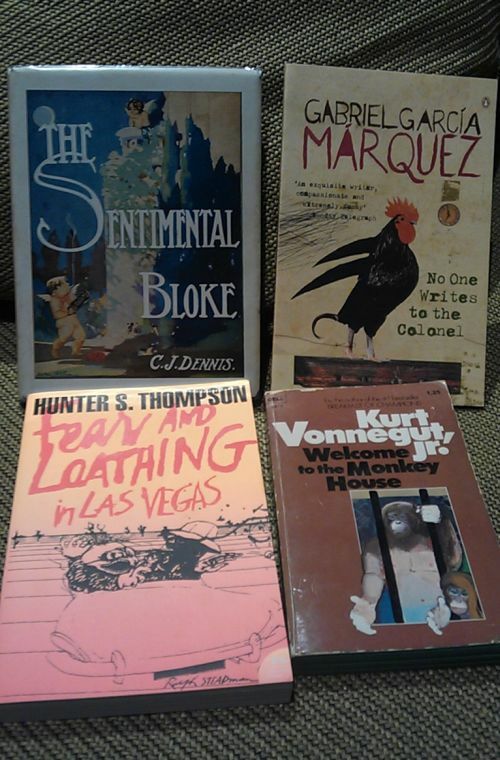 This collection is the result of walking through a weekend book fair in the Atrium of the NGV in Melbourne. I’ve started my reading with the Marquez…I didn’t like Love in the time of cholera, but I hope I like this. I would like to like his writing. As for the others? Well, I’ll get to them eventually!